Anthropologists working in a Spanish cave have discovered 17 skulls belonging to what appears to be an early form of Neanderthal. Surprisingly, these hominids had a relatively small brain case — which means Neanderthals evolved their big brains independent of our common ancestor. Incredibly, the remains of the proto-Neanderthals (known as the Sima people) are 430,000 years old, so they're likely too young to belong to Homo heidelbergenesis. What's more, the skulls, which were analyzed by Complutense University of Madrid paleoanthropologist Juan Luis Arsuaga and his colleagues, exhibit features characteristic of Neanderthals. They feature robust lower jaws, small teeth at the rear of the jaw, and thick brow ridges with a distinctive double arch. The skulls were found in a cave called Sima de los Huesos, a site in northern Spain's Atapuerca mountains. "This suggests that facial modification was the first step in the evolution of the Neandertal lineage, pointing to a mosaic pattern of evolution, with different anatomical and functional modules evolving at different rates," write the authors in their ensuing study. 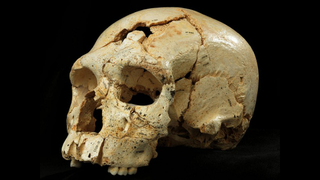 It's considered the "oldest reliably dated" fossils of proto-Neanderthals. And by facial modification, the skulls suggest that the earliest changes in the Neanderthal lineage occurred in the teeth, jaw and face — particularly those characteristics related to a specialization in chewing, probably an adaptation to meat eating. In turn, these small differences may have sent these people down a new evolutionary path. The skulls still exhibited primitive traits like a smaller brain case, while the Neanderthal trait of an elongated and rounded brain case came later. [I]f these small-brained Sima fossils are indeed ancestral only to Neandertals, then our cousins must have evolved their big brains independently from us. Rather than inheriting big brains from a common ancestor, Neandertals and modern humans each developed that trait on their own, perhaps favored by changes in climate, environment, or tool use experienced separately by the two species "more than half a million years of separate evolution," writes Jean-Jacques Hublin, a paleoanthropologist at the Max Planck Institute for Evolutionary Anthropology in Leipzig, Germany, in a commentary in Science. Some anthropologists say that instead of giving them a new name, we should refer to the Sima people as "early" or "archaic" Neanderthals. The reasoning is that European Neanderthals had already developed their own distinct "look" 430,000 years ago. Personally, I think they deserve their own classification. They're clearly distinct from a morphological perspective. And owing to their smaller brain case, they likely exhibited different behaviors. What's more, it's weird to refer to something by what it's about to become; evolution doesn't work that way (we don't refer to dinosaurs as proto-birds, for example). Though some species may be in the midst of evolving towards a fitness peak, each species is, at any given moment in time and space, adapted to its current (and not future) environment. Read the entire study at Science: "Neandertal roots: Cranial and chronological evidence from Sima de los Huesos." Image: Javier Trueba/Madrid Scientific Films.